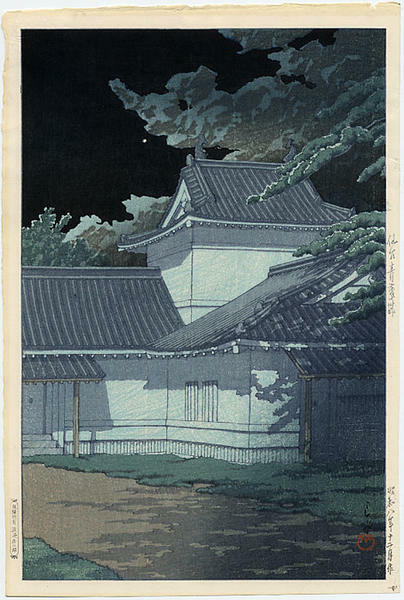 [Go Back] [New Search] Details for Kawase Hasui (1883-1957) "Aoba Castle in Sendai"
Date: originally published December 1933; Size: approx. 10.5" x 15.5"
Aoba Castle was built in 1600 by the powerful feudal lord Date Masamune. Because of considerations for the castle's defense, Masamune chose to locate his fortifications on Mount Aoba, 100 meters above the town below. In the last 400 years the castle endured the anti-feudal fervor of the Meiji era, a giant fire in 1882 and the carpet bombing of 1945. Now all that is left of the castle are remnants of the outer stone walls and a guard tower. Size: 15 x 10 "
Notes: Narazaki notes that, "Printing the sky in black was the concept here. Perhaps Hasui was following the example of Suzuki Harunobu". Built in 1602, Aoba Castle in Sendai, Miyagi Prefecture, was completely destroyed by Allied bombing in 1945 and has never been rebuilt.